Over the past few days a few articles in the news on Buddhist-style meditation caught my attention which show a growing trend in America. 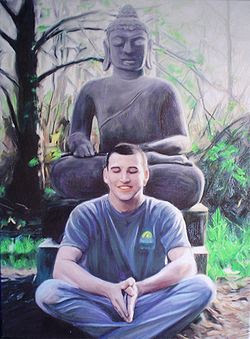 The first was titled "In the Arizona Desert, Buddhists Will Embark on a Three-Year Silent Retreat". Prolonged silence, they explain, is the only way to reach the deep level of inner awareness required to bring true happiness to the world. However it is not only silence that they are subjecting themselves to, but the attainment of thoughtlessness to escape suffering. Imagine having thoughtlessness as your goal in life? Talk about escapism that denies the realities of life! But then again, for Buddhists life is an illusion so there is no real sense of "reality". As the article explaines, for Buddhists "Life and death had no intrinsic meaning. Instead, reality depended on perception." The second article was titled "Massachusetts Meditation Center Draws Overstressed Young Adults". This article may seem more mild in its approach, since it seems to only be about young adults of the cyber-generation seeking relief of the stress in their life through meditation. But in essence it is exactly like the first article above, as it says: "Keeping even the most basic forms of communication, like speaking and writing, to a minimum, they meditated in silence, practicing vipassana, or insight meditation, an ancient Buddhist technique that involves focusing one’s attention on the present, on the breath, mind, and body." The goal is the same - to eliminate thoughts through techniques that will essentially help you to escape perceived reality for a reality imperceptable that is found deep within oneself. To be thoughtless through meditation may help someone appear to escape suffering and stress, but it denies human reason and higher values to the point where you risk even losing your humanity - let alone deny the existence of God outside of oneself. Many like to compare Buddhism with Christianity or with the Orthodox practice of Hesychasm, but the two are so polar opposite that one would have to go to great lengths to make such comparisons appear non-contradictory. But then again, the law of non-contradiction does not appear in this type of Eastern philosophy because if it did it would make it totally unreasonable. I also read a very interesting and fascinating account of a man who lives nearby me in Brookline who put years into practicing Zen Buddhism. His experience is a complete exposure of the dangers and falsehoods inherent in Buddhism and the utter contradiction it has with Christianity. Though its sort of long, I encourage you to read his testimony titled "Zen and the Art of Not Knowing God". Other examples of the new Eastern cults in the West could be multiplied; each year finds new ones, or new transformations of old ones. In addition to the overtly religious cults, the last decade especially has seen an increase of secular "consciousness cults," as one popular newsmagazine calls them (U.S. News and World Report, Feb. 16, 1976, p. 40). These "mindtherapy" groups include the "Erhard Seminars Training" established in 1971, "Rolfing," "Silva Mind Control," and various forms of "encounter" and "biofeedback," all of which offer a "release of tensions" and a "tapping of the hidden capabilities" of man, expressed in a more or less plausible 20th-century "scientific" jargon. One is reminded also of other "consciousness" movements that have become less fashionable today, from "Christian Science" to "Science of Mind" to "Scientology." All these movements are incompatible with Christianity. Orthodox Christians must be told absolutely to stay away from them. Why do we speak so categorically? 1. These movements have no foundation in Christian tradition or practice, but are purely the product of Eastern pagan religions or of modern spiritism, more or less diluted and often presented as "non-religious." They not only teach wrongly, not in accordance with Christian doctrine, about spiritual life; they also lead one, whether through pagan religious experiences or psychic experiments, into a wrong spiritual path whose end is spiritual and psychic disaster, and ultimately the loss of one's soul eternally. 2. Specifically, the experience of "spiritual quietness" which is given by various kinds of meditation, whether without specific religious content (as is claimed by "TM," some forms of Yoga and Zen, and the secular cults) or with pagan religious content (as in Hare Krishna, the "Divine Light Mission," "31-10," etc. ), is an entrance to the "cosmic" spiritual realm where the deeper side of the human personality enters into contact with actual spiritual beings. These beings, in man's fallen state, are first of all the demons or fallen spirits who are closest to man. Zen Buddhist meditators themselves, despite all their cautions about spiritual "experiences," describe their encounters with these spirits (mixed with human fantasies), all the while emphasizing that they are not "clinging" to them. 3. The "initiation" into experiences of the psychic realm which the "consciousness cults" provide involves one in something beyond the conscious control of the human will; thus, once having been "initiated," it is often a very difficult thing to untangle oneself from undesirable psychic experiences. In this way, the "new religious consciousness" becomes an enemy of Christianity that is much more powerful and dangerous than any of the heresies of the past. When experience is emphasized above doctrine, the normal Christian safeguards which protect one against the attacks of fallen spirits are removed or neutralized, and the passiveness and "openness" which characterize the new cults literally open one up to be used by demons. Studies of the experiences of many of the "consciousness cults" show that there is a regular progression in them from experiences which at first are "good" or "neutral" to experiences which become strange and frightening and in the end clearly demonic. Even the purely physical side of psychic disciplines like Yoga are dangerous, because they are derived from and dispose one towards the psychic attitudes and experiences which are the original purpose of Yoga practice. The seductive power of the "new religious consciousness" is so great today that it can take possession of one even while he believes that he is remaining a Christian. This is true not only of those who indulge in the superficial syncretisms or combinations of Christianity and Eastern religions which have been mentioned above; it is true also of an increasing number of people who regard themselves as fervent Christians. The profound ignorance of true Christian spiritual experience in our times is producing a false Christian "spirituality" whose nature is closely kin to the "new religious consciousness.